Many people mistakenly believe that breaches in cybersecurity result from expert hackers sophisticated techniques and high-tech equipment. 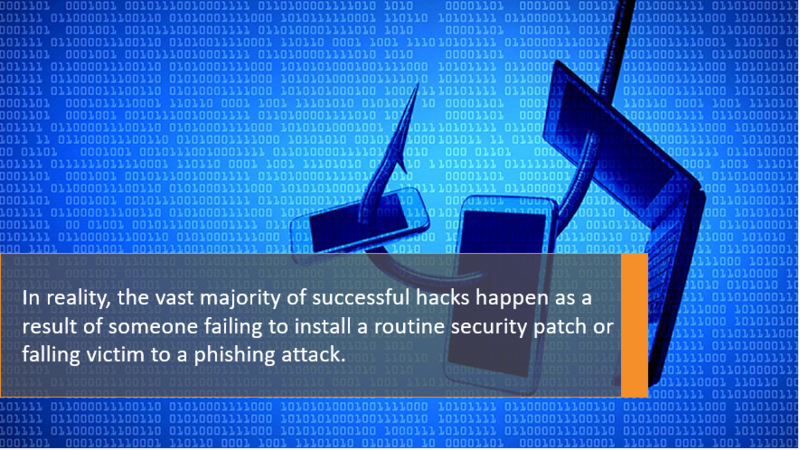 In reality, the vast majority of successful hacks happen as a result of someone failing to install a routine security patch or falling victim to a phishing attack. Both of these can be prevented with preventative measures, but there is a new solution available from HP. Phishing attacks usually involve some form of social engineering whereby an attacker attempts to retrieve data, usually login credentials, from a user. The term implies that a hacker is setting a trap and enticing a user to take the bait. Email phishing scams have become quite common. This type of attack involves sending an email to a particular person. The email will contain either a file to download, a link to click, or a request for some personal information. The file will often contain malware, as will the site that the link directs to. Sometimes users are tricked into giving up information either through a simple request that appears to come from a legitimate source or by visiting a fake website. HP laptop security comes complete with Sure Click, which creates a “virtual machine” between the browser and every site you visit. A virtual machine isolates a certain part of your digital environment, meaning that any potential threat that makes its way into the VM will be contained within it and lack the ability to spread throughout the system. Whenever a user clicks to a different site, Sure Click will activate and create a layer of visualization between the browser and the rest of the PC’s system. This is a brilliant innovation that provides a high-tech solution for the everyday user. For now, Sure Click only works with two specific browsers – Chromium and Internet Explorer. HP EliteBook protection comes complete with HP Sure Click technology. As far as a browser is concerned, HP Sure Click initiates an automatic response to the detection of malware that creates a barrier between the browser and the broader PC system. In order to facilitate an effective attack, malware has to get back out to another machine. Without being able to do this, the attacker behind the malware can’t accomplish anything. When malware is contained, it has no way to communicate back to its malicious servers. Having this sort of compartmentalization of software means that even if you do fall victim to a phishing attack, it probably won’t be of much consequence. The National Institute of Standards and Technology (NIST) creates standards for cybersecurity protocols. HP security protection includes the five elementary factors of NIST cybersecurity, including protection, identification, detection, response, and recovery. HP Sure Click protects devices by initiating automatic responses to identification and detection of malicious activity. Due to functioning in this manner, HP devices will most likely never have to worry about recovery, as they will have stopped the threat before anything has been lost. NIST.gov states that NIST standards are geared toward protecting critical infrastructure. NIST security compliance is yet another testament to the great security standards that HP PCs and printers adhere to. All things considered, HP client security protection is a cut above the competition. Are there other aspects of cybersecurity to consider? While HP Sure Click stops attacks at the source, having a complete cybersecurity plan in place is still necessary in today’s work environments. Every plan starts with training. While training is an absolute must, HP Sure Click provides a level of protection that meets and exceeds government standards. If you want to stop attacks before they start, your team needs to have access to HP devices. ABM Federal provides HP printers and laptops to its customers. Contact us today for more information on how to outfit your team with devices that have HP Sure Click.